Now I must admit. I have heard about Ms. Marvel or Captain Marvel a couple of times from fellow comic book readers, but I had never really read a comic book about Captain Marvel before and therefore, I do not know much about her character (other than the fact that she had a rivalry with Rogue from the X-Men, due to Rogue stealing her powers and putting her in a coma). So, when I heard that Marvel was making a “Ms. Marvel” series that would have a protagonist who was of Muslim background, I was seriously excited at the prospect of having a diverse superhero in the Marvel Universe! 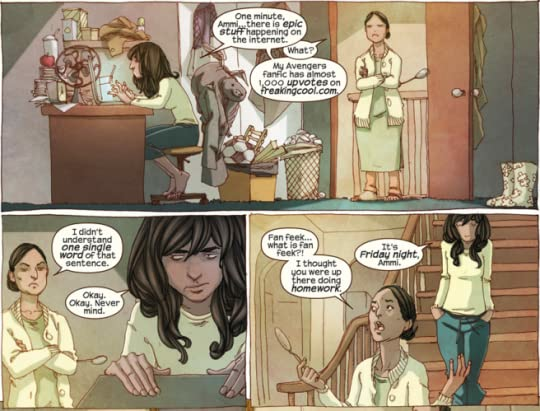 Kamala Khan was your average teenage girl who happens to live in Jersey City and comes from a Muslim family. One day however, a mysterious mist overcomes Jersey City and Kamala soon finds herself obtaining powers such as stretching her limbs out to unbelievable lengths and shapeshifting into different forms. Unfortunately, not only does Kamala have a hard time controlling her newfound powers, but she suffers from an identity crisis as she tries to figure out what kind of superhero she wants to be: a superhero that is exactly like Captain Marvel or a superhero where she can express her true personality and beliefs through her newfound powers? G. Willow Wilson’s writing: I will admit that this is the first time that I had ever read a comic book by G. Willow Wilson (or this could possibly be her first comic book), so I was interested to see what kind of new storylines G. Willow Wilson could bring to the Marvel Universe. Lo and behold, I was pleasantly surprised by G. Willow Wilson’s witty and emotional writing of Kamala Khan, the new Ms. Marvel! I loved the way that G. Willow Wilson wrote Kamala Khan’s character as Kamala is shown as being a spunky girl who wants to be a superhero, but she is not sure of what kind of superhero she should be and I loved the fact that this issue is explored and how it affects Kamala throughout the story. I also loved the fact that this story is extremely lighthearted with some intense moments here and there as it gives the story so much depth regarding the characters and it is nice to have a superhero series that has a light tone that could resonate with the readers. 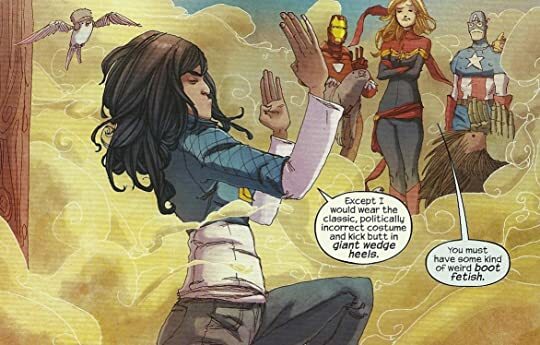 I also think that G. Willow Wilson did an excellent job at not making Kamala’s Muslim background into something stereotypical, but into something that makes Kamala unique in her own way and it was great seeing what Muslim culture is like within a superhero community as it gives more diversity to the story since it is rare that we see Middle Eastern superheroes being portrayed in superhero comic books. Adrian Alphona’s artwork: Adrian Alphona’s artwork is both gorgeous and hilarious to look at as the characters are drawn realistically and there are some panels where the characters’ skins glow against sunlight and moonlight and gives their appearances a mesmerizing feel. I also loved the way that Adrian Alphona drew the humorous expressions on the characters whenever they are shocked or scared as it made the artwork into something unique as you have both comedic and dramatic artwork within the same story. For anyone who does not like language in comic books, this graphic novel does have some language such as the constant use of the “p” word, but other than that, this graphic novel is pretty tame compared to some of the darker and grittier superhero comic books.